NUMS announced merit list of open merit seats for MBBS and BDS admissions. NUMS highest merit for AMC is 93.0051 and lowest merit is 90.0496. Candidates name appeared in first merit list they have to submit fee before 1st November 2017. Students failed to submit fee on time their admission will be cancel and seat will be offered to other student. www.pakprep.com provide complete preparation material for Medical colleges admissions. We have more than 15000+ MCQ’s with answers and explanation. To start your preparation click here. Here is the merit list of MBBS & BDS for Army Medical College (AMC). This entry was posted in Army Medical, NUMS and tagged AMC, AMC 2017, AMC Admission Form, AMC admission form 2017, AMC Admission Test, AMC Admission test 2016, AMC Biology MCQs, AMC Biology MCQs with answer, AMC Biology MCQs with explanation, AMC Biology MCQs with solution, AMC Chemistry MCQs, AMC Chemistry MCQs with answer, AMC Chemistry MCQs with answers, AMC Chemistry MCQs with solution, AMC Entry Test, AMC MBBS, AMC MCQs, AMC Merit list, AMC Past Papers, AMC Physics MCQs, AMC Physics MCQs with answer, answers key for NUMS, How to Apply for Army Medical College (AMC), How to fill application Form for AMC, How to fill application Form for NUMS, how to get AMC roll number slip, how to get NUMS roll number slip, How to prepare for AMC admission test, NTS NUMS, NTS NUMS Admission, NTS NUMS Test Answer Key, NTS NUMS Test Answer Key 2017, NUMS, NUMS Admission, NUMS Admission test, NUMS BDS, NUMS BDS Admission, NUMS BDS Admission 2017, NUMS BDS Admissions, NUMS BDS Admissions 2017, NUMS Biology MCQs, NUMS Biology MCQs with answers, NUMS Biology MCQs with explanation, NUMS Biology MCQs with solution, NUMS Chemistry MCQs with solution, NUMS English MCQ's, NUMS English MCQ's with answer, NUMS Entry Test, nums entry test preparation, NUMS MBBS Admission, NUMS MBBS Admission 2017, NUMS MBBS Admissions 2017, NUMS MBBS Merit list, NUMS MBBS Merit list 2017, NUMS MCQS, NUMS MOCK test, NUMS Pastpapers, NUMS Result, NUMS test format, nums test result, nums test result 2017 on October 23, 2017 by Pakprep.com Admin. To get admission in Army Medical College (AMC), CHM Lahore, CMH Multan, Wah Medical College and Quetta institute of Medical Sciences in MBBS & BDS students have to appear in NUMS entry test. Every year thousands of students appears in NUMS test only few secure admission in AMC and other affiliated colleges of NUMS due to less number of seats available. NUMS/AMC entry test is very conceptual due to which only those students can get good marks who have good knowledge of subjects included in NUMS entry test. To get desired results in NUMS/AMC test students have to prepare all course books and practice maximum MCQ’s of Physics, Biology, Chemistry and English. AS in NUMS/ AMC less number of seats are available which led the competition so high, we recommend all students to practice maximum MCQ’s from www.pakprep.com for NUMS/AMC entry test. 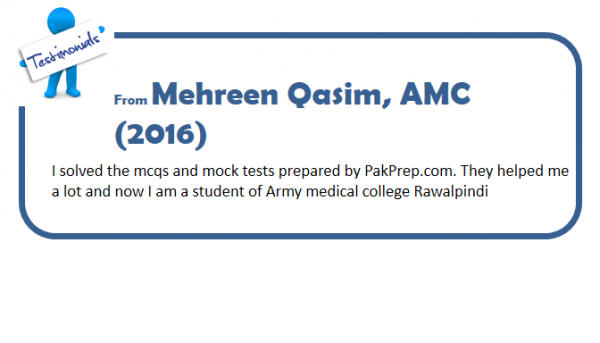 www.pakprep.com provides more than 15000+ MCQ’s with answers and solution. For your preparation click here. Here are some sample MCQ’s of Biology for AMC/NUMS test with answers and solution. This entry was posted in Army Medical, NUMS and tagged AMC, AMC 2017, AMC Admission Form, AMC Admission Test, AMC Admission test 2016, AMC Biology MCQs, AMC Biology MCQs with answer, AMC Biology MCQs with answers, AMC Biology MCQs with explanation, AMC Biology MCQs with solution, AMC Chemistry MCQs, AMC Chemistry MCQs with answer, AMC Chemistry MCQs with answers, AMC Chemistry MCQs with explanation, AMC Chemistry MCQs with solution, AMC Entry Test, AMC MBBS, AMC MCQs, AMC MCQs with answer, AMC MCQs with answers, AMC MCQs with explanation, AMC MCQs with solution, AMC Merit list, AMC Merit list 2016, AMC Past Papers, AMC Physics MCQs, AMC Physics MCQs with answer, AMC registration, AMC registration 2017, AMC registrations, AMC registrations 2017., amc test result, How to prepare for AMC admission test, How to prepare for NUMS admission test, mbbs, MBBS 2016, MBBS 2017, MBBS admission, MBBS admission 2016, MBBS admission 2017, MBBS Admission Test, MBBS Admission Test 2016, MBBS Admission Test 2017, MBBS in Pakistan, mbbs merit list, MBBS Merit list 2016, NTS NUMS, NTS NUMS Admission, NUMS, NUMS Admission, NUMS admission 2017, NUMS Admission form, NUMS Admission test, NUMS admission test 2016, NUMS admission test 2017, NUMS admissions 2017, NUMS Answer Key, NUMS BDS, NUMS BDS Admission, NUMS BDS Admission 2017, NUMS BDS Admissions, NUMS BDS Admissions 2017, NUMS Biology MCQs, NUMS Biology MCQs with answer, NUMS Biology MCQs with answers, NUMS Biology MCQs with explanation, NUMS Biology MCQs with solution, NUMS Chemistry MCQs, NUMS Chemistry MCQs with answer, NUMS Chemistry MCQs with answers, NUMS Chemistry MCQs with explanation, NUMS Chemistry MCQs with solution, NUMS English MCQ's, NUMS English MCQ's with answer, NUMS English MCQ's with answers, NUMS English MCQ's with explanation, NUMS English MCQ's with solution, NUMS Entry Test, nums entry test preparation, NUMS MBBS, NUMS MBBS Admission, NUMS MBBS Admission 2017, NUMS MBBS Admissions, NUMS MBBS Admissions 2017, NUMS MBBS Merit list, NUMS MBBS Merit list 2016, NUMS MCQS, NUMS MOCK test, NUMS Pastpapers, NUMS Physics MCQs, NUMS Physics MCQs with answer, NUMS Physics MCQs with answers, NUMS Physics MCQs with explanation, NUMS Physics MCQs with solution, NUMS Registration, NUMS Registration 2017, NUMS registration date, NUMS registration date 2017, NUMS registration dates, NUMS registration dates 2017, NUMS Result, nums test, NUMS test format, nums test result on August 14, 2017 by Pakprep.com Admin. NUMS test will consist of Physics, Biology, Chemistry and English MCQ’s for Army Medical College (AMC), Wah medical college, CMH Lahore, CMH Multan and other affiliated medical colleges. NUMS test contains total 180 MCQ’s. There will be 70 MCQ’s of Biology, 45 MCQ’s of Physics, 45 MCQ’s of Chemistry, and 20 MCQ’s of English. Here are some chemistry MCQ’s with answers and solution for AMC/NUMS test. www.pakprep.com provides complete material for the preparation of AMC and NUMS test. We have more than 15000+ fully explained MCQ’s with solution which help students to get good marks in AMC/NUMS test. To start your preparation Click here. This entry was posted in Army Medical, NUMS and tagged AMC, AMC 2017, AMC Admission Form, AMC Admission Test, AMC Admission test 2016, AMC Biology MCQs, AMC Biology MCQs with answer, AMC Biology MCQs with answers, AMC Biology MCQs with explanation, AMC Biology MCQs with solution, AMC Chemistry MCQs, AMC Chemistry MCQs with answers, AMC Chemistry MCQs with explanation, AMC Chemistry MCQs with solution, AMC Entry Test, AMC MBBS, AMC MCQs, AMC MCQs with answer, AMC MCQs with answers, AMC MCQs with explanation, AMC MCQs with solution, AMC Merit list, AMC Merit list 2016, AMC Past Papers, AMC Physics MCQs, AMC Physics MCQs with answer, AMC registration 2017, AMC registrations, amc test result, How to prepare for AMC admission test, How to prepare for NUMS admission test, mbbs, MBBS 2016, MBBS 2017, MBBS admission, MBBS admission 2016, MBBS admission 2017, MBBS Admission Test, MBBS Admission Test 2016, MBBS Admission Test 2017, MBBS in Pakistan, MBBS Merit list 2016, NTS NUMS, NTS NUMS Admission, NUMS, NUMS Admission, NUMS admission 2017, NUMS Admission form, NUMS Admission test, NUMS admission test 2016, NUMS admission test 2017, NUMS admissions 2017, NUMS Answer Key, NUMS BDS, NUMS BDS Admission, NUMS BDS Admission 2017, NUMS BDS Admissions 2017, NUMS Biology MCQs, NUMS Biology MCQs with answer, NUMS Biology MCQs with answers, NUMS Biology MCQs with explanation, NUMS Biology MCQs with solution, NUMS Chemistry MCQs, NUMS Chemistry MCQs with answer, NUMS Chemistry MCQs with answers, NUMS Chemistry MCQs with explanation, NUMS Chemistry MCQs with solution, NUMS English MCQ's, NUMS English MCQ's with answer, NUMS English MCQ's with explanation, NUMS English MCQ's with solution, NUMS Entry Test, nums entry test preparation, NUMS MBBS, NUMS MBBS Admission, NUMS MBBS Admission 2017, NUMS MBBS Admissions, NUMS MBBS Admissions 2017, NUMS MBBS Merit list, NUMS MBBS Merit list 2016, NUMS MCQS, nums merit list, NUMS merit list 2016, NUMS MOCK test, NUMS Pastpapers, NUMS Physics MCQs, NUMS Physics MCQs with answer, NUMS Physics MCQs with answers, NUMS Physics MCQs with explanation, NUMS Physics MCQs with solution, NUMS Registration, NUMS Registration 2017, NUMS registration date, NUMS registration dates, NUMS registration dates 2017, NUMS Result, NUMS solved papers, nums test, NUMS test format, nums test result on August 8, 2017 by Pakprep.com Admin.